iaedp International Chapter President Dra. Juana Poulisis, MD, PHD joined by its Chair of Central America Dra. Rosanna Mauro, MSc, RD, CEDRD, Chair of Bulgaria Elisaveta Pavlova, PhD, CEDS, IE-PRO, Chair of Canada Susan Osher, MSc, RD, CEDRD, and Chair of Italy Dr. Anna Scelzo, MBSc(Psy)Hons. 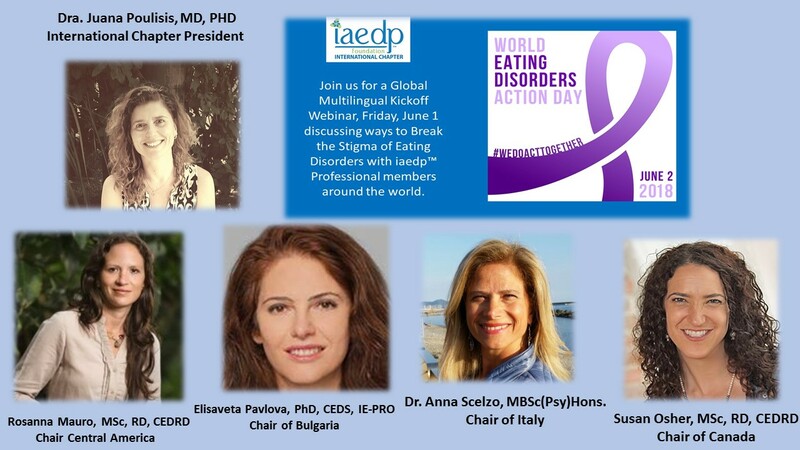 Are you an International Eating Disorders Professional or want to work in this field? Do you want to connect with other ED Professionals in your Country or Region of the World? Would you like to associate yourself with the world’s leading organization dedicated to the education, training, and certification of multidisciplinary professionals who treat the full spectrum of eating disorder problems? Would you like to receive expert raining from the comfort of your home or office? If you answered yes to any of these questions, please contact Blanche@iaedp.com or visit our website www.iaedp.com.